Standing on the edges of the United Arab Emirates’ deserts, including the Empty Quarter that extends into Saudi Arabia, Abu Dhabi makes a wonderful point of departure for dune-based adventures. 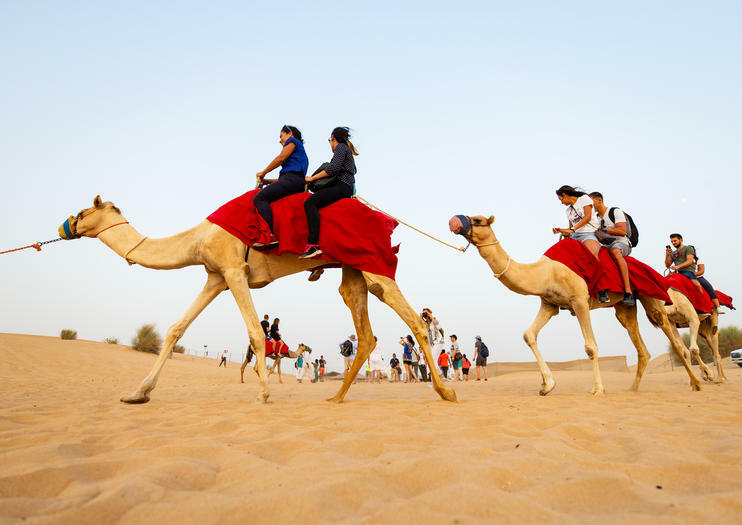 From camel rides to Bedouin-style camps, here are some of the top desert experiences available from the UAE capital. The most popular desert trips from Abu Dhabi fill the afternoon and evening, and feature sports, Bedouin traditions, and dinner at an Arabian Nights-inspired camp. Most begin with a 4WD dune bash, sunset photo ops, camel riding, and sand boarding. Then, it’s on to a tented camp for activities such as henna painting, falcon displays, and a barbecue buffet dinner and belly dancing shows beneath the stars. Sports-only trips are ideal if you want to enjoy the all-action opportunities of the desert and don’t mind skipping the usual afternoon and evening entertainment. Many of these trips happen in the cool of morning and include ATV or dune buggy treks, or sports such as dune bashing and sand boarding. Perfect for travelers with limited time, combo tours let you experience a number of different activities in one time-saving and hassle-free package. Some options team an afternoon-evening desert safari with an Abu Dhabi city tour and a Dhow boat dinner cruise, all packed into two days of sightseeing. Situated on the fringes of the UAE’s Empty Quarter—also known as the Rub’ Al Khali—Liwa is one of the country’s most beautiful deserts, and is characterized by towering red dunes. Trips to Liwa give you a feel for the scale and beauty of a large Arabian desert. Full-day group or private tours include dune drives, a visit to Liwa Fort, and usually, lunch at a desert resort. Popular with couples and groups seeking quieter, less-crowded trips, private desert tours come in many different forms. Options include lantern-lit dinners for two in the dunes, intimate sunrise tours, and personal wildlife safaris followed by a private dinner table at an exclusive desert retreat. Experience the UAE desert at both of its most magical times—sunset and sunrise—with an overnight desert expedition. Most start with a classic evening desert-and-dinner tour before letting you sleep in your own Bedouin-style tent or desert villa, so you can wake to breakfast and dawn breaking over the dunes.